Let’s get some of the terminology straight before we get too far. Coverage/Cover – This is a term used often in the insurance world to explain which procedures insurance companies will pay for. Technically Samaritan doesn’t “cover” anything, as they are not an insurance company. They facilitate the publishing and sharing of medical needs among members. Samaritan doesn’t pay any bills directly themselves so they can’t technically cover anything. But their guidelines explain which needs are publishable. Throughout the site I will use the terms together because we’re used to the term “cover” or “coverage” in relation to our healthcare bills, but it’s important to remember that in the end Samaritan isn’t paying our medical bills, we are. Members are sending money to each other directly to help pay our medical bills, and the determination for which bills can be shared in this fashion is outlined in the member guidelines. Needs – these are the bills you submit to Samaritan when you have a medical need. Click image for explanation of share slip. Link takes you to Samaritan website. Shares – these are the monthly payments (similar to a premium) we send to members who have needs. Needs and shares are matched by computer so that every member is sending to a specific need (customized newsletters) and it balances. The monthly shares we send are not random amounts, they aredetermined by household size and are established to match the typical amount needed to meet the bills coming in. Personal Responsibility – the amount members pay toward any need before shares kick in. It’s similar to a deductible. Your personal responsibility starts at $300 and can be reduced to zero as you obtain discounts. What happens if there are more shares than needs? Samaritan could reduce your monthly share if there aren’t a lot of needs that month. This has happened quite recently with 4 consecutive months being reduced (late 2014/early 2015). Have you ever heard of an insurance company reducing your monthly payment? Nope. Didn’t think so. What happens if there are more needs than shares? This can happen. In that case Samaritan prorates the money so members with needs get the same percentage of money. The most they have prorated is at 80%, meaning a $10,000 need will have $8,000 shared. This leaves 20% for members to pay on their own (A regular 80/20 co-insurance plan would do this all the time, it’s fairly rare with Samaritan). But don’t freak out, if this happens Samaritan will either roll that 20% to the next month (only if the next month has a reduction in needs), or distribute money from the prorata fund. 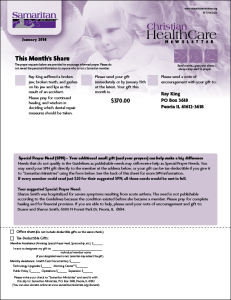 When a month is prorated every member is notified in their newsletter and are welcome to send extra to the main office to the prorata fund, or send extra direct to their assigned need. Generally the prorata fund has enough in it to pay out the remaining 20% within a couple of months because we have some very generous members. In the history of Samaritan 100% of prorated needs have been fully shared or the need has been met by additional discounts or other sources. That’s pretty awesome. If three months in a row are prorated members will vote for a possible share increase. Prorating is done by design. There are a couple other healthcare sharing ministries and they take bills on a first come first serve basis. That means backlogs can and do develop when there are too many bills for the amount of money available. Samaritan doesn’t want you or your provider to go without for too long. That’s why they prorate, so that members get the biggest bulk of the money on time, and the rest comes shortly after. Sometimes people are able to get additional discounts when there’s been a prorate, other times money has come in the form of savings on a different bill. God will provide. Samaritan will call you personally to see if you still need the prorated money in case additional discounts came in (or maybe more bills came in, they also want to share those)… and then they will cut you a check for the bills you still need to pay for that medical need. It’s a great system set in motion so that we don’t wait a long time for payment. Samaritan has the fastest and most consistent payment schedule of all the ministries (remember the money is coming to you, not direct to the doctor). In my research I found one of the other ministries took a year to pay a need. Wow, no way I’m going to wait that long. I did a more detailed description of the prorating process here.